Explain to me: What is air rotary drilling and why do we use it? If you are not familiar with the drill power industry, then it can be easy to get lost in the jargon associated with our work. 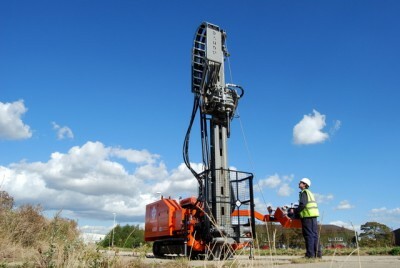 Whether it is percussion drilling, core drilling, or exploration and quarry drilling, it can be difficult to distinguish the different methods, their individual benefits and disadvantages, and their uses. To help discern one area from another, we have compiled a detailed guide to one drilling method we adopt and the various details you should know about it. The basics of air rotary drilling. As explained on our website, air rotary drilling used a blade, PCD or tricone bit, or downhole hammer to penetrate the ground. Before we continue, you should know that a PCD bit is short for Polycrystalline Diamond Composite/Compact. These bits have incredible endurance and are mostly used to shear down the area being drilled. Using this technology, compressed air is used as the drill flush to lubricate and cool the bit and carry drill cuttings to the surface. The air by itself in air rotary drilling lifts the cuttings from the formation being drilled. According to Well Drilling School, the air is supplied by a large compressor, which then transports that air to the swivel hose connected to the drill pipe. The cuttings will be removed from the area when the air going down the drill pipe leaves through small ports. When the air escapes, it will push the cuttings up and to the surface. In what cases is it used? The common project that this technique is employed for is open-hole drilling. The chip samples that are received from the drilling are sufficient to be logged and then sampled, as needed. In addition to this, air rotary drilling can be a second option when other approaches haven’t worked. For example, when drilling through cobbles and boulders the nature of the material will cause a number of obstructions that only this method can be used effectively upon. As we have previously written, it can save a considerable amount of time than other techniques but the equipment and compressors needed for it occur far exceeds the alternatives. Air rotary drilling is sometimes referred to as RAB or Rotary Air Blast drilling, which further confuses people. RAB is similar in its function to rotary air, with a spinning drilling bit forcing its way through an ore to then blow the materials back to the surface. RAB drilling goes to lower depths, to approximately 25m and is mostly used for mineral exploration, water bore drilling and blast hole drilling, according to Outback Drilling. The important part to know is that if you hear the terms, they are after interchangeable. If you are interested in knowing more about this field or employing our services, then please get in touch with us so we can further discuss! We are more than happy to visit sites and discuss access requirements for our equipment to mobilising.